Orbital floor fractures may result when a blunt object, which is of equal or greater diameter than the orbital aperture, strikes the eye. The globe usually does not rupture, and the resultant force is transmitted throughout the orbit causing a fracture of the orbital floor. Signs and symptoms can be quite varied, ranging from asymptomatic with minimal bruising and swelling to diplopia, enophthalmos, hypo-ophthalmia (ie, hypoglobus), and hypoesthesia of the cheek and upper gum on the affected side. Treatment is titrated to the degree of injury. See the image below. Coronal CT scan of orbits demonstrating loss of orbital floor on the left in contrast to the normal orbital floor on the right. With simple blowout fractures, there may be no morbidity at all, or the patient may complain of diplopia, enophthalmos, or hypoesthesia of the cheek and gum. Edema and ecchymosis of the eyelids and periorbital region usually are seen but are temporary. With any injury that involves a sinus, air may escape into the orbit or subcutaneous tissues. This is called orbital emphysema. 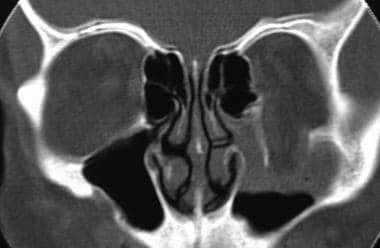 Enophthalmos may result when large orbital floor fractures occur and orbital contents prolapse into the maxillary sinus. If a medial wall fracture also has occurred, the enophthalmos may be compounded due to prolapse of orbital contents into the ethmoid sinus. Orbital edema that occurs at the time of injury initially may mask the enophthalmos, but the sunken eye appearance will become more apparent over the following 1-2 weeks as the edema subsides. Fractures along the floor usually affect the infraorbital groove and therefore the infraorbital nerve. The resultant neuropraxia causes hypoesthesia of the cheek and upper gum on the affected side. This is usually temporary but can last up to 6 months or longer. In severe injuries, the hypoesthesia may be permanent. Because the usual mechanism of injury is assault with a blunt object, the vast majority of cases occur in males. In a study of facial fractures in an urban population, 81% of the patients were males. Most cases do well, and most patients obtain resolution of diplopia and correction of enophthalmos. Warn patients to avoid strenuous activity and to use common sense when determining their postoperative activity level. Warn patients to avoid nose blowing for several weeks after the injury and repair. Educate patients about nerve damage recovery. An injured motor nerve (third nerve branch) or sensory nerve (infraorbital nerve) can take weeks or months to return to normal. In some cases, the damage may be permanent. For excellent patient education resources, visit eMedicineHealth's Eye and Vision Center and Skin Conditions and Beauty Center. Also, see eMedicineHealth's patient education articles Black Eye and Bruises. Della Rocca RC, Nassif JM. Blowout fractures. Linberg JV, ed. Oculoplastic and Orbital Emergencies. Appleton & Lange; 1990. 155-165. Green RP Jr, Peters DR, Shore JW, et al. Force necessary to fracture the orbital floor. Ophthal Plast Reconstr Surg. 1990. 6(3):211-7. [Medline]. Kersten RC. Blowout fracture of the orbital floor with entrapment caused by isolated trauma to the orbital rim. Am J Ophthalmol. 1987 Feb 15. 103(2):215-20. [Medline]. Bansagi ZC, Meyer DR. Internal orbital fractures in the pediatric age group: characterization and management. Ophthalmology. 2000 May. 107(5):829-36. [Medline]. Rubin PAD, Bilyk JR, Shore JW. Management of orbital trauma: fractures, hemorrhage, and traumatic optic neuropathy. Focal Points: Clinical Modules for Ophthalmologists. 1994. 12:7. Gilbard SM, Mafee MF, Lagouros PA, et al. Orbital blowout fractures. The prognostic significance of computed tomography. Ophthalmology. 1985 Nov. 92(11):1523-8. [Medline]. Tan Baser N, Bulutoglu R, Celebi NU, Aslan G. Clinical management and reconstruction of isolated orbital floor fractures: The role of computed tomography during preoperative evaluation. Ulus Travma Acil Cerrahi Derg. 2011 Nov. 17(6):545-53. [Medline]. Smith B, Regan WF. Blow-out fractures of the orbit: mechanism and correction of internal orbital fracture. Am J Ophthalmol. 1957. 44:733. Piombino P, Iaconetta G, Ciccarelli R, Romeo A, Spinzia A, Califano L. Repair of orbital floor fractures: our experience and new technical findings. Craniomaxillofac Trauma Reconstr. 2010 Dec. 3(4):217-22. [Medline]. [Full Text]. Jordan DR, Allen LH, White J, et al. Intervention within days for some orbital floor fractures: the white-eyed blowout. Ophthal Plast Reconstr Surg. 1998 Nov. 14(6):379-90. [Medline]. Egbert JE, May K, Kersten RC, et al. Pediatric orbital floor fracture : direct extraocular muscle involvement. Ophthalmology. 2000 Oct. 107(10):1875-9. [Medline]. Magaña FG, Arzac RM, De Hilario Avilés L. Combined use of titanium mesh and resorbable PLLA-PGA implant in the treatment of large orbital floor fractures. J Craniofac Surg. 2011 Nov. 22(6):1991-5. [Medline].